Ascending Mexico’s highlands: Part One. Subiendo el altiplano: Parte Uno. 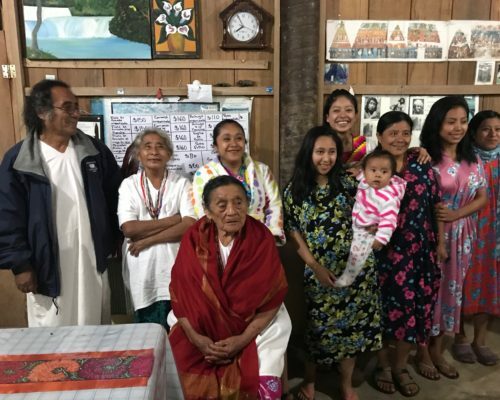 We’ve just returned from a wonderful trip, commencing at the Gulf of Mexico, near Villahermosa, gradually moving upland to about 7000 feet, at San Cristóbal de las Casas, in Chiapas – the southern-most state. Up front, I want to tell readers what a peaceful experience we’ve had, living and traveling in Mexico. Yes, all countries have violence. (Look at daily mass-shootings, of four-or-more victims in schools and churches in US, and compare that to cartel corpses hanging from bridges in Mexico – along with some violent robberies – asking which is worse – not that anyone wishes to compete in these categories!) O, may equality of opportunity come soon, to both lands! AMEN. 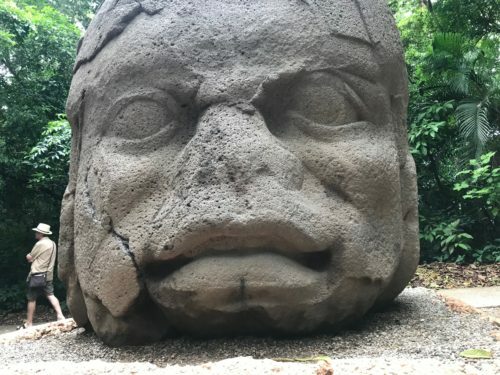 From the sculpture park at La Venta, our attentive and thorough tour-guide, Marina Aguirre, took us to the Lacandon jungle where a small number of Mayan families have governed the jungle, and retained many of their ancient cultural practices. 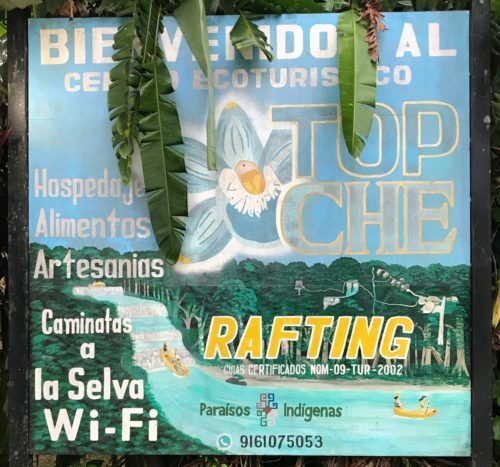 We stayed at a welcoming but modest inn, called TOP CHE run by one of these families, and we also visited nearby ruins on the mighty Usumacinta River, by boat, not by “rafting”. Grandfather Enrique, & clan : grandaughter Top Che, biggest smile, back row. River boat, to Yaxchilán ruins. 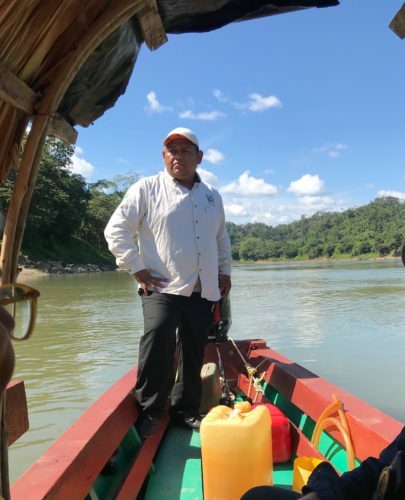 Our sturdy, steady, river pilot –he looks like a La Venta head! no? 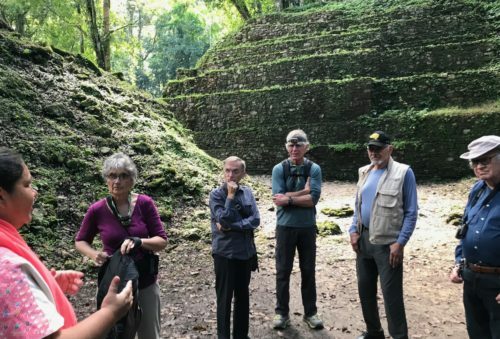 Marina addresses group of 17 at entry of protective maze to Yaxchilán. Great mound & stele, along “superhighway” of river. 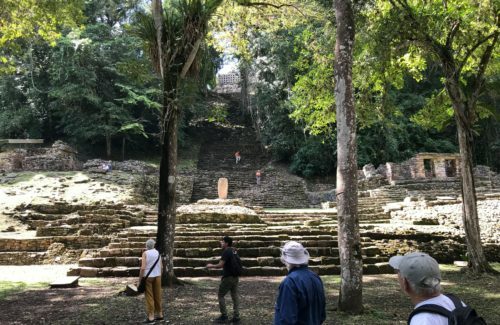 More to come, in Part Two : Palenque, and San Cristóbal de las Casas.